Emma is a London based singer working in a variety of genres including jazz, pop, soul and musical theatre, as both a live artist and session singer. 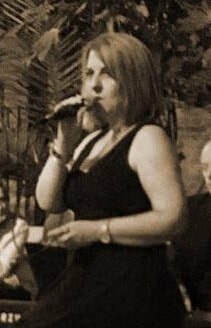 With a gigging repertoire spanning across the genres from Gershwin and Cole Porter, through to Stevie Wonder and Amy Winehouse, Emma can cater for all tastes. From simple piano or guitar accompaniment through to a full band, she can provide laid-back dinner jazz, or create a lively swing feel through to a full soul sound. Internationally, Emma was sponsored by Hilton Hotels to fly to Addis Abbaba, Ethiopia to perform and launch new music venue Indigo. She has worked alongside Geoff Castle, Derek Nash, Stan Robinson, Dominic Ashworth and numerous established jazz musicians. Listen below to some of Emma's live jazz tracks with Christian Vaughan on piano and Andy Hamill on bass. "Emma Finlay and her jazz trio stole our Rotary Christmas Concert. Emma's beautiful jazz voice truly made the evening for us. A definite 10/10 for us. She will be invited back for more events." "Emma sang for your wedding and was just sensational. She is great to work with, multi-talented and I couldn't recommend her more highly." Emma's recordings include various albums. commercials and new musical theatre. She has recorded new material for the writing team Nicol Walsh and Ville Hilden and her past recordings have won awards including the Great American Song Contest, USA Songwriting Competition, UK Songwriting Contest and Unisong International Songwriting Contest.